“In the short run, the market is a voting machine but in the long run, it is a weighing machine." Sentiment across global markets recovered this month as oil prices have corrected by more than 30% from the highs in the first week of October while the U.S. Fed Chairman’s (surprise) comments about possibly going slower on future FED rate hikes also played an important part in boosting sentiment towards the end of the month. The much-anticipated meeting between President Trump and President Xi at the G20 has led to a near term thaw in the US-China trade war which should relieve some of the pressure on overall market sentiment. However, we can expect more developments on the trade war front in the first quarter of 2019 as talks between both sides continue. OPEC has also agreed on a crude oil supply cut of 1.2 million barrels a day which is 20% more than what most market participants were expecting. However, if oil prices remain within their current range of USD50-60/barrel then it would be positive for the current accounts of oil importing countries in the frontier and emerging markets universe and within our universe stable oil prices would be positive for Bangladesh, Mongolia, Pakistan, and Sri Lanka. Valuations across our universe remain very attractive and we expect some of the factors holding back our markets to be resolved as we enter 2019, i.e. national elections due in Bangladesh on 30th December 2018, a possible IMF loan to Pakistan in 1Q19, greater political clarity in Sri Lanka and further implications of the US-China trade war on Vietnam, with expectations of the net effect on Vietnam being positive, due to the country becoming a low cost manufacturing hub, fitting well into the North Asian/South East Asian supply chains, and offering political stability. In this month’s travel report we write about our recent visit to Bangladesh, a market which we are very positive on over the next three to five years due to a large young population, increasing income levels and improving infrastructure while the market in general is not on the radar of many international fund managers. 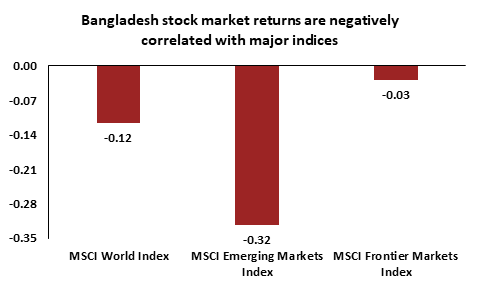 Bangladesh is also negatively correlated to global markets with a negative correlation of -0.12 with the MSCI World Index over the past five years which makes it a good diversification tool in a diversified international portfolio. 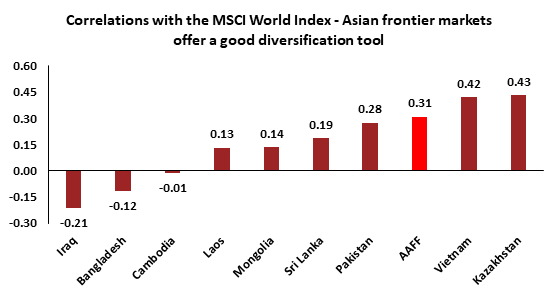 Further on the subject of correlations, the AFC Asia Frontier Fund’s correlation with the MSCI World Index over the last five years has been 0.31x while the correlations of our universe with the MSCI World Index are also very low (see chart below). 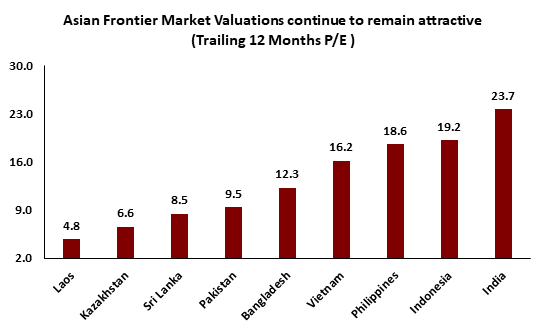 Hence, contrary to the perception of frontier markets in general being risky, frontier markets in Asia are less volatile when combined in a portfolio resulting in lower annualised volatilities with the AFC Asia Frontier Fund and AFC Vietnam Fund having annualised volatilities since inception of 9.3% and 8.6% respectively. The AFC Asia Frontier Fund (AAFF) USD A-shares declined -1.5% in November 2018. The fund outperformed the AFC Frontier Asia Adjusted Index (-2.6%) but underperformed the MSCI Frontier Markets Asia Net Total Return USD Index (+2.9%), the MSCI Frontier Markets Net Total Return USD Index (+2.2%) and the MSCI World Net Total Return USD Index (+1.1%). 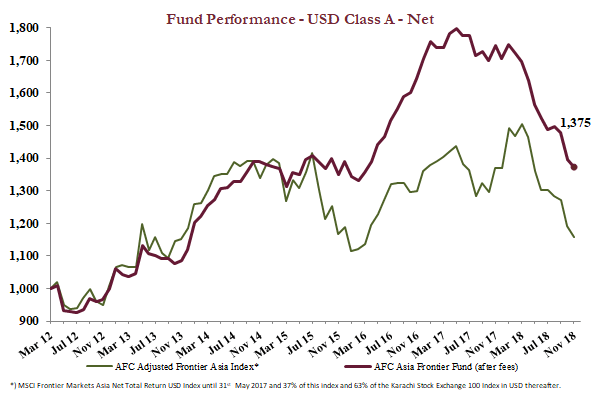 The performance of the AFC Asia Frontier Fund A-shares since inception on 31st March 2012 now stands at +37.5% versus the AFC Frontier Asia Adjusted Index, which is up +15.9% during the same time period. The fund’s annualized performance since inception is +4.9% p.a., while its YTD performance stands at -19.5%. The broad diversification of the fund’s portfolio has resulted in lower risk with an annualised volatility of 9.29%, a Sharpe ratio of 0.47 and a correlation of the fund versus the MSCI World Net Total Return USD Index of 0.37, all based on monthly observations since inception. Overall market sentiment improved slightly this month as oil prices have corrected by more than 30% from the highs seen in the first week of October while the U.S. Fed Chairman’s surprise comments about going slow on further FED-interest rate hikes were also a positive for investor sentiment. Valuations for our universe continue to remain attractive and with long term economic growth not being the issue in our markets, we expect that many of the factors holding back the markets in our universe will be resolved in 2019, i.e. elections in Bangladesh due on 30th December 2018, a possible IMF loan to Pakistan in 1Q19, greater political clarity in Sri Lanka and implications of the US-China trade war on Vietnam (with net impact expected to be positive). The fund had a positive performance until the last eight trading days of the month during which time overall performance was impacted due to two individual holdings (interestingly both listed in London), a Myanmar focused investment holding company and a Mongolian junior oil & gas company, with each costing performance by 65 basis points and 34 basis points respectively. The move in the Myanmar holding company appears to look like a “one off” due to poor stock liquidity on the AIM market in London, as our two other major positions in Myanmar did very well this month. Further, on the last trading day of the month, the Pakistani Rupee (PKR) depreciated by 3.3% which had a 25 basis points negative impact despite the fund having the lowest exposure to Pakistan since inception. Therefore, a relatively good month was unfortunately negated by a few individual factors towards the end of the month. The fund had a positive performance in Bangladesh despite the market there being soft in the run up to national elections as the fund’s healthcare holdings did well with both the pharmaceutical companies that the fund holds trading at attractive valuations and below their five-year average P/E ratios. We are positive on Bangladesh going into 2019 and expect a lot of the overhang on sentiment to improve post elections which will be held on 30th December 2018. Vietnam also contributed positively to performance this month with good moves for the fund’s construction and infrastructure companies, all of which are priced extremely cheaply with trailing twelve-month P/E’s of <10x while order books remain stable on the back of strong industrial production and GDP growth. The fund’s Vietnamese automotive holding company continues to have a good run on the back of strong 3rd quarter numbers for Honda Vietnam while valuations remain very attractive at a trailing twelve-month P/E of 10.1x and dividend yield of 7.3%. The government this month also ratified the CPTPP (Comprehensive and Progressive Agreement for Trans-Pacific Partnership), which is a similar trade deal to the erstwhile TPP but without participation of the U.S. Such trade deals integrate Vietnam further into global trade and supply chains and are another long-term positive for the Vietnamese manufacturing sector. Two of the fund’s Myanmar focused holdings, a conglomerate and a junior miner, delivered returns of 47% and 26% respectively this month. Both of these companies’ stock prices have been hurt less due to fundamentals and more due to the negative press surrounding the country in the previous months. The conglomerate declared good quarterly results due to an improvement in its real estate division while its consumer and financial services arms continue to do well. The junior mining company also made a positive announcement with respect to further developments at its polymetallic mine. In Pakistan, the Central Bank raised benchmark interest rates by 150 basis points, which was more than expected most likely due to higher inflation expectations in 2019 while the PKR depreciated by 3.3% on the last day of the month. The PKR weakness did not come as a surprise to us as we were expecting further currency depreciation in the run up to a possible IMF loan in 1Q19 which would be a good time to reassess our current weight in Pakistan, which is the lowest since the inception of the fund. The political situation in Sri Lanka continues to remain fluid as the Supreme Court ordered Parliament to reconvene and put on hold the call for early elections, and we expect some sort of political clarity to emerge in the next few weeks. The fund’s weight in Sri Lanka is less than 4% (also the lowest since the inception of the fund) so the current issues do not have a major impact on the fund’s performance. However, company specific valuations are looking very attractive now in the banking sector where the top three private sector banks by assets are trading at a price/book ratio of less than 1.0x. Uzbekistan continued its reforms during the month with the most notable ones being the establishment of a position within the Ministry of Foreign Trade with the sole focus of leading the negotiations and ascension of Uzbekistan into the World Trade Organization and the government’s plan to liberalize the aviation industry, while turning the state-owned Uzbekistan Airways into a regional competitor. A local stock broker has also kicked off the roadshow for an industrial products manufacturer where the government is conducting a partial sell down of its stake, in line with the government mandate for the state to divest all non-core investments in the country. As part of this sell down the government intends to provide the proceeds from its share sale to the company in the form of a soft loan as the company currently operates at 100% capacity and needs to expand its production facilities. This should add greater liquidity to the company’s shares, as well as attract new investors, local and foreign, into the stock market and thus help to increase the depth of the market. The best performing indexes in the AAFF universe in November were Cambodia (+9.2%), Kazakhstan (+2.0%), and Vietnam (+1.3%). The poorest performing markets were Mongolia (-6.0%) and Pakistan (-2.8%). The top-performing portfolio stocks this month were: a cement company from Uzbekistan (+52.4%), a Myanmar focused conglomerate (+47.1%), a junior mining company based in Myanmar (+26.0%), a Mongolian tour operator (+23.0%), and another cement company from Uzbekistan (+20%). In November, we added to existing positions in Kyrgyzstan, Mongolia, Papua New Guinea, Uzbekistan and Vietnam. We partially exited one port operator in Cambodia and from three companies in Mongolia, while completely exiting from a Mongolian financial holding company and an oil engineering company from Uzbekistan. As of 30th November 2018, the portfolio was invested in 113 companies, 1 fund and held 2.9% in cash. The two biggest stock positions were a pharmaceutical company in Bangladesh (7.3%) and a pump manufacturer from Vietnam (5.0%). 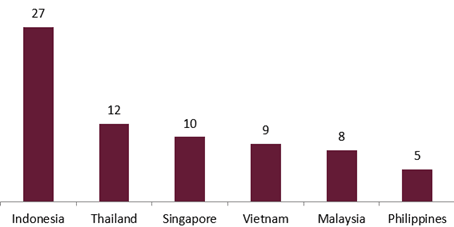 The countries with the largest asset allocation include Vietnam (25.9%), Bangladesh (20.2%), and Mongolia (18.6%). The sectors with the largest allocations of assets are consumer goods (29.1%) and industrials (21.1%). The estimated weighted average trailing portfolio P/E ratio (only companies with profit) was 12.05x, the estimated weighted average P/B ratio was 2.02x, and the estimated portfolio dividend yield was 3.73%. 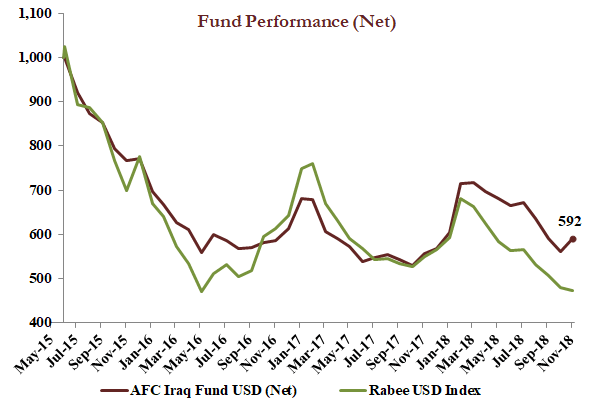 The AFC Iraq Fund Class D shares returned +5.3% in November with a NAV of USD 591.67 which is an outperformance versus its benchmark, the Rabee USD Index (RSISUSD index), which was down −1.7%. Year to date the AFC Iraq Fund Class D shares are up +4.3% versus a loss of −16.6% for the RSISUSD index. Average daily turnover in November continued to improve, increasing 24% on the back of October’s 24% month-on-month growth. 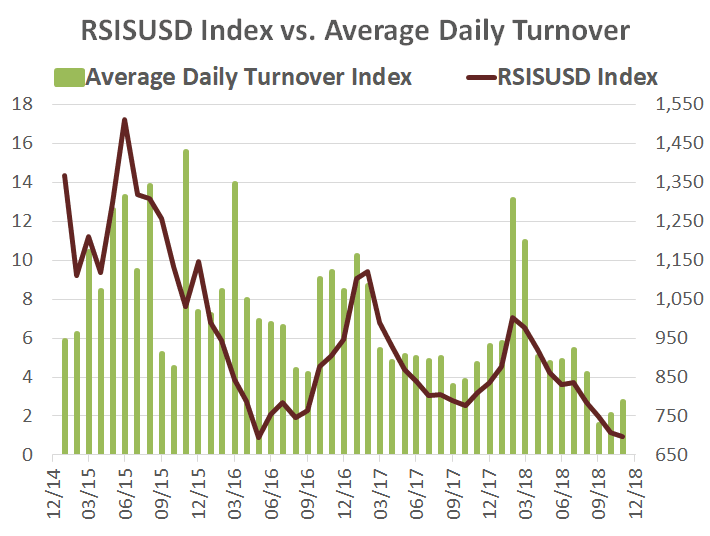 However, the recovery is coming from an incredibly low base (USD 275,000) and still shows the average daily turnover in-line with the dismal levels of September, which were among the lowest for some time (chart below). With the gradual recovery in turnover, the market, as measured by the RSISUSD Index, moderated its month-on-month declines, down −1.7% for the month – continuing to test the major bottom of May 2016. The fund on the other hand was significantly up for the month, thanks to a broader selection of stocks as compared to the index, with a higher quantity of banking stocks, a less top-heavy concentration and an overweight position in telecom. A nascent recovery in telecoms adds support to this line of reasoning. The two major mobile operators out of three national operators reported Q3/2018 earnings that display the markers of recovery in earnings, margins, and profits. Of the two, AsiaCell (TASC) has been listed since 2013 and as such its reported earnings span the period 2012-2018, and thus reflects the operating environment before, during and just after the ISIS conflict. TASC’s earnings profile marked by rapidly increasing revenues - driven by the country’s adoption of mobile phones – peaked in 2013. The turn for the worst started in late 2013 with the increasing violence before the May 2014 elections, which accelerated by mid-2014 with the ISIS invasion and the loss of over a third of the country, and with that a significant loss in TASC’s subscriber base. The roll out of 3G in early 2015 brought its own set of problems. The amortization of the fees of USD307 million (on top of fees of USD1,250 million in 2007 for a 15-year licence) to access the 3G spectrum increased costs meaningfully. Revenues took a hit as free IP voice telephony soon replaced most expensive regular telephony - especially for international calls, while data fees could not fully replace these lost voice revenues. This was compounded by increased competition among the three mobile operators as they sought to replace both lost consumers and voice revenues through competitive price offerings to lure consumers from each other. Capping the woes of mobile operators was the severe economic decline brought about by the ISIS conflict and the collapse in oil prices as non-oil GDP declined by -3.9%, -9.6% and -8.1% for 2014, 2015 and 2016, respectively. Finally, the resultant weaknesses in both consumer and business demand was made much worse with the introduction of 20% VAT on phone cards in the summer of 2016. 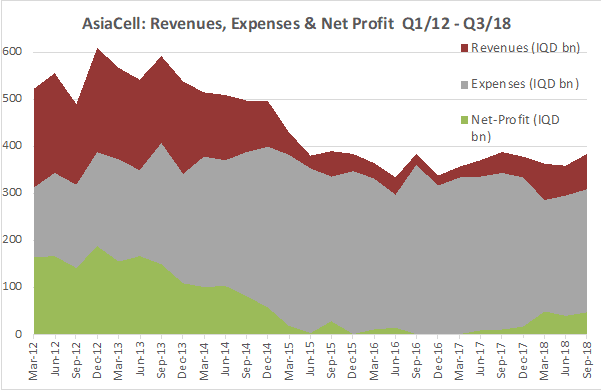 For TASC, the revenue decline and cost increases crushed its profits (as the chart above shows), however this decline in profits was moderated by very strict cost controls and decreasing capital expenditures reflecting an earlier heavy investment in infrastructure. The bottoming in revenues over the last few years came to an end in late 2017 with the liberation of Mosul and the gradual return of customers which contributed to the recovery in profitability. The company signalled its confidence in its future outlook with a distribution of a 12% dividend on the back of last year’s 14% dividend - however, in absolute terms the dividend is about one third higher than that of last year. The grandfathering of the transition to 3G, the amortization of the licence and the effects of the VAT introduction, all coupled with the return of customers as well as the expected growth in data usage, should lead to a healthy period of resumed earnings growth. Recovery in frontier markets is a mirror image of Mark’s Twain’s phrase on going broke, in that recovery happens gradually and then suddenly. If similar experiences in other frontier markets of declining prices while fundamentals point to a start of a gradual recovery, then the trend of the last few months could be followed by a sharp reversal to the upside. As of 30th November 2018, the AFC Iraq Fund was invested in 14 names and held 4.1% in cash. The fund invests in both local and foreign listed companies that have the majority of their business activities in Iraq. The markets with the largest asset allocation were Iraq (96.3%), Norway (3.0%), and the UK (0.7%). The sectors with the largest allocation of assets were financials (46.5%) and communications (21.5%). The estimated trailing median portfolio P/E ratio was 11.05x, the estimated trailing weighted average P/B ratio was 0.81x, and the estimated portfolio dividend yield was 6.57%. 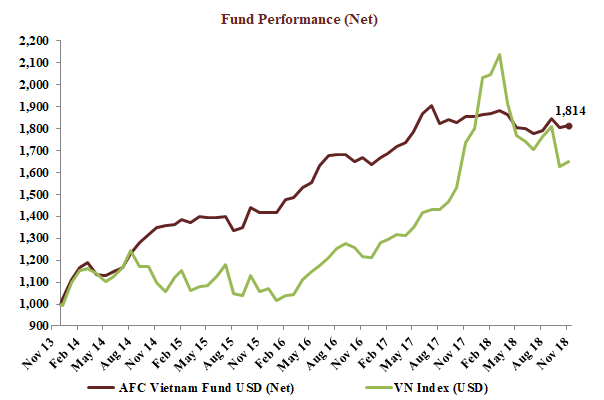 The AFC Vietnam Fund returned +0.4% in November with a NAV of USD 1,813.88, bringing the return since inception to +81.4%. This represents an annualised return of +12.8% p.a. The Ho Chi Minh City VN Index in USD gained +1.3%, while the Hanoi VH Index lost −0.5% (in USD terms). The broad diversification of the fund’s portfolio resulted in a low annualized volatility of 8.64%, a high Sharpe ratio of 1.40, and a low correlation of the fund versus the MSCI World Index USD of 0.27, all based on monthly observations. November’s market activity was characterized by less volatility and sharply lower volume. Investors’ nerves calmed, but they stayed mostly on the sidelines. Major indices ended mixed with HCMC up and Hanoi down while mid- and small-caps were mixed with only a few companies in our portfolio showing stronger movements. With only one month left in 2018, it is time to sum up the events of this year and provide some initial thoughts about investments in 2019. As we all know, 2018 was a year most investors would like to forget, especially if Santa Claus doesn’t bring surprisingly strong gains in December. It will be remembered in the history books of finance for many things (including the meltdown in cryptocurrencies), but certainly not for a disastrous year in equities. What many investors have forgotten over the past few years of more or less continuous gains is simply that stock markets are not a one-way street, and a year of losing 10% on average in world stock markets is not really anything special in the world of investing. As a general rule, people investing with a time horizon of 1-2 years should refrain from investing in stock markets. Many current investors around the world are first time buyers who were attracted by non-stop gains in recent years, especially in the tech sector. Like in all previous bull markets, they are now getting caught by adjustments in stock prices due to unsustainable valuations. The same can be said for markets like Vietnam, where a long-term investment horizon is even more important as we are investing there for an economic and stock market outperformance not only in the next 1-2 years, but rather for the next 1-2 generations. This does not mean, however, that we are not looking for short term gains as well, but there are many factors in politics and financial markets which influence the price of stocks which have little to do with the business activities of the invested companies. Like a dog owner walking his dog on a leash, the dog will sometimes be ahead and sometimes behind his owner, but overall, he will walk along with him – very similar to the economy and its stock market – the only problem is that we don’t know how long the leash is. With our investment approach we try to reduce volatility in our portfolio as much as possible (so far very successfully), so investors do not have to worry too much about these short-term swings. We have continuously highlighted situations of overvaluation in some areas of our reports over the past 12-18 months and explained why we are not concerned at all about our investments in Vietnam. The small bubble in Vietnam’s blue chips, which started in the second half of 2017 and lasted until the end of the first quarter of 2018, brought some short-term headaches for value investors like us, but of course didn’t change our long-term belief that we should do well with our investments in undervalued companies which host healthy balance sheets and high dividend yields, thus reducing the volatility of our fund sharply. This has been proven over the past 5 years. Despite the excellent current performance of the Vietnamese economy - and outperformance in comparison with other economies in Asia and around the globe – the stock market corrected 27% from the top in early April, and it again shows very promising valuations. While we have held up much better than the market during corrections, our portfolio is still 1/3 cheaper than the index and the dividend yield of our investments is 3x the market average. 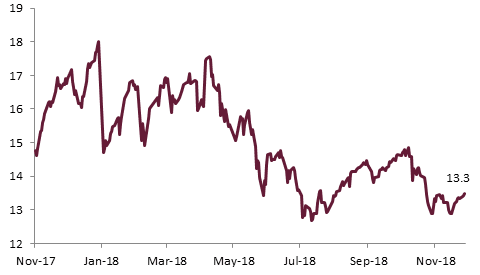 The reason for the weakness in Vietnamese equities is not too difficult to pinpoint on a daily basis: trade tensions and corrections in major markets. But this environment also brings with it the perfect buying argument for long-term investors looking for higher returns in promising markets. The outperformance of the US market, which is now already 9 years long, looks like it may be coming to an end, which makes a long-term reversal to the mean from here increasingly likely. Not many times in history have emerging markets traded at such a deep-discount to US equities. Many emerging market currencies went through a correction in 2018 and now look attractive, and the prospect of robust growth driven by a burgeoning population of youthful middle-class workers and consumers will at one point be given as an explanation when those markets start to outperform again. There are not many contrarian investors around (which we believe is a fruitful long-term strategy as many well-known and successful investors have proven in the past), but instead emerging markets are currently dominated by scared and nervous market participants. 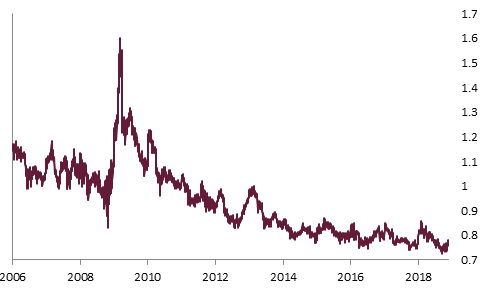 Those pessimists are still pointing to risks in currency and debt markets like we saw 20 years ago during the Asian Financial Crisis. But many countries have learned their lessons since then and the main risk – debt denominated in foreign currencies – is with a few exceptions for most countries much lower than for many developed countries and also much lower than 20 years ago. China, South Korea, Taiwan, India, Brazil, South Africa, Mexico, and Russia make up over 80% of the MSCI Emerging Markets Index, but on average their USD debt is below 10%. Considering all these arguments above, we are very optimistic about the prospects for emerging markets in Asia and particularly Vietnam, of course. Trade still remains the primary driver for the continued expansion of Vietnam. With its low labour costs and comparatively young and growing population, Vietnam remains an attractive manufacturing hub. Another compelling factor for Vietnam’s positive economic outlook is the strong and upcoming domestic market, which will further support headline growth. And on top of this, the strong growth in tourism which is at a record high in the first nine months of this year, the healthy labour market and consumer sales which have been growing at double-digits since last year all put our fund in a very comfortable position. According to both Temasek Holdings and Google, the internet economy of Southeast Asia is expanding fast, from USD 72 billion in 2018 to an estimated USD 240 billion by 2025. E-commerce will be the most important component of this growth with an estimated volume of USD 23 billion in 2018 to USD 102 billion in 2025. It therefore doesn’t come as a surprise that a record number of successful fund raisings have been done in this industry. In the first 6 months of 2018, investors poured USD 9.1 billion into internet companies compared to USD 9.4 billion in all of 2017. Vietnam is one of the fastest growing internet economies with an expected compounded annual growth rate of 25% between 2015 and 2025. The overall volume is expected to reach USD 9 billion in 2018, just behind Singapore, which boasts the highest GDP per capita in the region, but significantly higher than the Philippines which has a population of over 100 million. 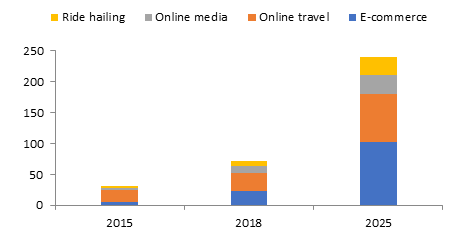 The online shopping industry has boomed in Vietnam in recent years after giant players such as Lazada (part of Alibaba), Shopee (part of Tencent) and Tiki (part of JD.com) entered Vietnam. According to http://vietnamreport.net.vn (Vietnam Report Joint Stock Company), a professional market researcher, the total Vietnamese retail market is estimated to be at USD 120 billion in 2017 and expected to reach USD 160 billion by 2020. With a population of around 94 million people, Vietnam is becoming a promising destination for a lot of global internet companies such as Alibaba or even Amazon in the near future. The conversion from traditional shopping to online shopping is a key factor for the growth of the Vietnamese e-commerce industry. Even though the online shopping business is booming, online revenues contribute to only 6-7% of total retail sales, according to that research, and hence still have massive room for further growth. 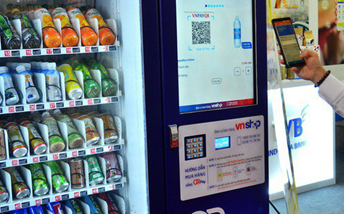 With the fast-growing e-commerce sector in Vietnam, online payment service providers are also enjoying increasing demand and growth, such as Momo and VNPay, for example. These technology companies are the connections between banks, financial institutions, sellers and buyers. These online payment methods are quick, convenient and quite secure. This is the reason why they are very popular, especially among younger shoppers who are always ready to try out new geeky apps. Vietnamese trade volume for the first 10 months of 2018 reached a record high at USD 441 billion, increasing by 13.8% compared to same period last year. Total exports were USD 224 billion and imports USD 217 billion, which equates to a trade surplus of USD 7 billion. At the end of November 2018, the fund’s largest positions were: Agriculture Bank Insurance JSC (4.1%) – an insurance company, Vietnam Container Shipping JSC (2.9%) – a container port management company, Sametel Corporation (2.9%) – a manufacturer of electrical and telecom equipment, TanCang Logistics and Stevedoring JSC (2.4%) – a logistics company, and Pharmedic Pharmaceutical Medical JSC (2.1%) – a pharmaceutical company. The portfolio was invested in 68 names and held 4.5% in cash. The sectors with the largest allocation of assets were industrials (33.0%) and consumer goods (19.9%). The fund’s estimated weighted average trailing P/E ratio was 9.30x, the estimated weighted average P/B ratio was 1.49x and the estimated portfolio dividend yield was 7.48%. In line with our process of being on the ground in the countries we invest in, Senior Investment Analyst Ruchir Desai recently travelled to Bangladesh to meet with management of portfolio and shortlisted companies. Photos are by Asia Frontier Capital, except where otherwise noted. 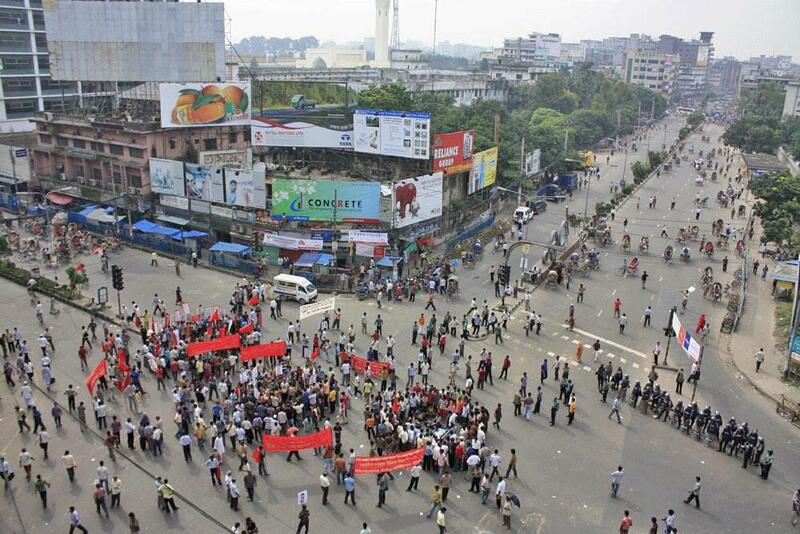 Bangladesh: A country which in the past has been more commonly in the news for public strikes (hartals), cyclones and floods and at times for military coups. These perceptions though are just one part of the story – the country has done exceptionally well both economically and socially over the past decade with GDP growth of greater than 6% since 2010 which has helped increase income levels that have now overtaken some South Asian peers such as Pakistan. The last 12-18 months have been a bit weak for the country’s macro-economic backdrop with a rising current account deficit but over the longer term, Bangladesh’s macro-economic metrics have been more stable than some of its peers in South Asia as well as in the frontier market universe. Its fiscal deficit as a % of GDP has not been more than 5% over the past decade (a big achievement amongst the frontier and emerging markets universe) while its current account, which was in the surplus over the past few years, has only gone into negative territory over the last 12-18 months due to rising machinery imports and now higher oil prices. Government gross debt to GDP at 33% is also significantly better than most regional or frontier market comparisons. 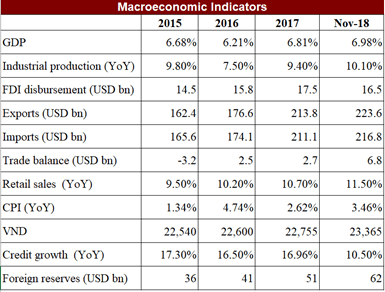 Another positive for macro stability are foreign exchange reserves, standing at USD 31 billion, providing around six months of import cover – a relatively better position to be in compared to other frontier markets in the region which have recently had issues with foreign exchange reserves or balance of payments. This build-up of foreign exchange reserves has been aided by a growing garment industry whose exports touched USD 31 billion in the most recent financial year ended June 2018 and this industry has been one of the mainstays of foreign exchange earnings as garment exports account for 80% of the country’s exports. Besides preferential access to the European market, the Bangladeshi garment industry benefits from a large labour pool while wages at USD 95/month are significantly lower than those in competing nations like Cambodia, China and Vietnam. A combination of these factors has now made Bangladesh the second biggest garment exporter after China. Worker remittances have also played a big role in building up foreign exchange reserves and these have rebounded in the latest financial year ended June 2018 by 17% to USD 15 billion (6% of GDP) due to a weaker currency and in the first five months of this financial year, they are up by 9% year over year. Politics, which has in the past led to violent protests especially in the run up to national elections, appear to be a thing of the past with the current government having a firm grip on overall affairs which has led to a relatively stable environment in the run up to national elections on 30th December 2018. Given the economic and political expectations over the next few years it was a good time to visit Dhaka to get a feel of things by being on the ground. Despite some of the perceptions, Bangladesh’s relatively stable economy offers a huge potential given its GDP of around USD 260 billon and population of 165 million which makes it amongst the larger economies in the region after China and India. Perceptions aside, this market should not be ignored as income levels rise for a large young population with a median age of 26 who will be a large consuming market over the next decade. 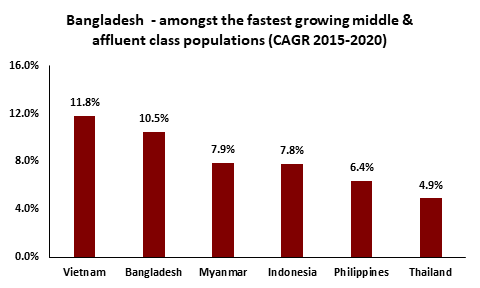 In fact, Bangladesh is expected to have one of the fastest growing middle and affluent class populations just after Vietnam. It is for this reason that many global and regional automotive firms have decided to put up assembly plants in the country. 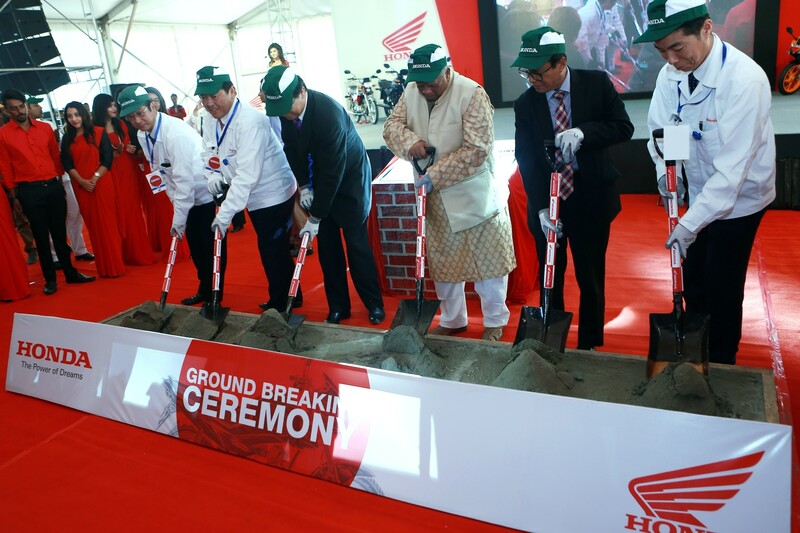 Honda has recently opened its motorcycle factory with a capacity of 100,000 units while Indian peers Hero MotoCorp and Bajaj Auto have also set up motorcycle assembly plants in the recent past. It is not a surprise that such investments are being made as the motorcycle market in Bangladesh has massive growth potential as annual sales in 2017 were only about 390,000 units, a miniscule number give the size of the population and with Pakistan and Vietnam doing annual motorcycle sales of around 1.9 million and 3.2 million respectively. From a listed equity perspective there could be ways to play this theme, as Runner Auto, a local motorcycle company lists next year. Consumer appliances is also a growth area due to very low penetration levels for various products. Washing machine, air conditioner and refrigerator penetration levels in Bangladesh are at 2%, 3% and 20% respectively – much lower than levels seen in regional peers or globally. The AFC Asia Frontier Fund owns Singer Bangladesh which is one of the leading manufacturers and retailers of white goods and has displayed good growth rates over the past few years with the current year’s net profits having grown by more than 20% on the back of rising refrigerator and television sales. Singer has built up a good value for money brand in the country which allows it to compete with some of the larger global brands like Samsung and LG. Furthermore, the announcement by Samsung a few months ago that it will begin assembling smartphones in the country for the domestic market brings home the point about the consumer opportunity that Bangladesh offers. Smartphone penetration is still only at around 30% while data revenues for Grameenphone, the country’s largest mobile services provider, are growing by 15-20%. Another sector which is expected to do well with rising consumer disposable incomes is the pharmaceutical sector which has grown cumulatively by 16% over the past five years and there is enough room to grow this size further as per capita healthcare expenditure in Bangladesh at USD 32 is still extremely low relative to regional peers. The domestic pharmaceutical market is dominated by the large players of which Square Pharmaceuticals and Beximco Pharmaceuticals are the No. 1 and No. 3 by market share and the AFC Asia Frontier Fund owns both these names. The recent correction in their share prices has made their valuations more attractive at a trailing twelve month P/E of 16.7x and 12.5x respectively while both have shown greater than 10% cumulative earnings growth over the last five years – a very robust performance. Exports of Bangladeshi pharmaceutical products are also picking up though they are still in the early stages of growth with total exports of just over USD 100 million. Both Square Pharmaceuticals and Beximco Pharmaceuticals are taking the lead in this area as each of them have won approval from the U.S. FDA to launch some products in the U.S. market. The banking sector is going through issues related to high non-performing loans which is a risk to the system, however most of these non-performing loans are concentrated in state run banks (as is the case in most developing markets) while most of the private sector banks are well run and have a large opportunity in front of them as the economy develops and income levels rise. 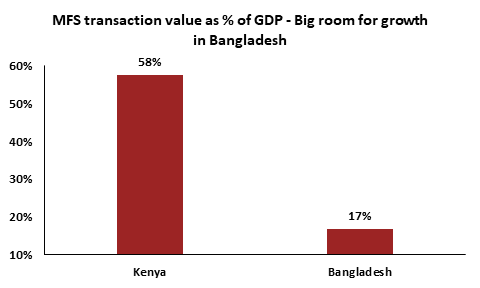 Mobile Financial Services (MFS) in Bangladesh has immense potential given that a large part of the population does not have a bank account while the penetration of smart phones can lead to significant growth in mobile based digital payments (think Paytm from India and m-pesa from Kenya). One of the private sector banks which has taken the lead in MFS is Brac Bank which has its own product named Bkash. Bkash has the first mover advantage as it was one of the first MFS products to be launched in Bangladesh and this has helped it capture a 70% market share of all MFS transactions and the brand has become synonymous with transferring funds digitally or making digital payments. In April 2018, Alipay acquired a 20% stake in Bkash and this investment will go a long way in further developing the digital payments platform. At the moment, the majority of transactions on the Bkash platform are simple deposit/withdrawal transactions but the future growth would come from retail/digital payments as Bkash plans to build out its point of sales network over the next few years. 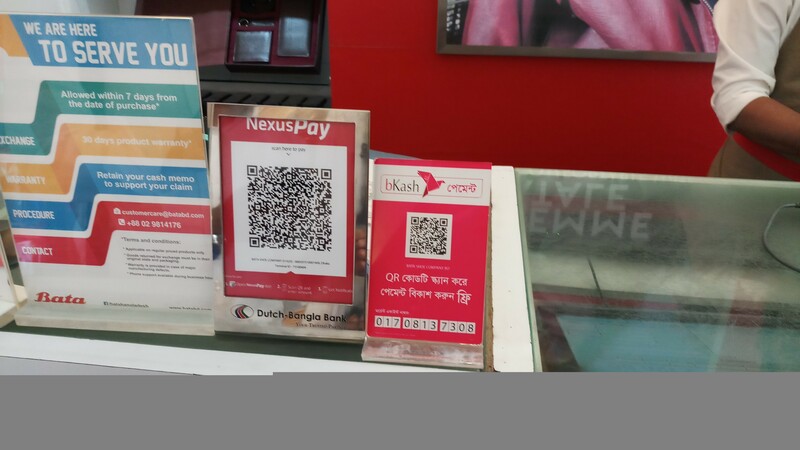 Already, in most retail outlets in Dhaka, one can pay digitally using the Bkash mobile app and this trend is only beginning. Moving around Dhaka, either within the city or to and from the airport, it is quite evident that the country’s infrastructure lags the region and this actually is an opportunity as there are a number of projects being undertaken to improve the efficiency of logistics. The Padma Bridge which is being developed will link the Southwest region of Bangladesh with Dhaka and help develop this region further while the Dhaka-Chittagong highway is being expanded into four lanes from two which will also help reduce travel time between Dhaka and Chittagong in the Southeast which is the biggest port of the county. 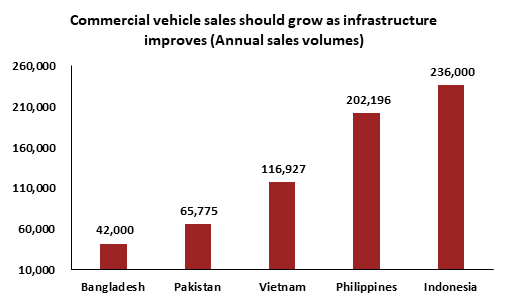 These infrastructure developments should help commercial vehicle sales, which have grown at around 20% over the last five years, and should have healthy growth going ahead as the number of commercial vehicles sold annually in Bangladesh is still significantly lower compared to countries of a similar range of GDP or population. Given the potential, Indian companies such as Ashok Leyland have set up assembly plants with their local partners (IFAD Autos which the AFC Asia Frontier Fund holds) while Tata Motors and Eicher Motors are also looking to put up or expand existing local assembling capacity and reduce dependency on imported units. One can also see a few more changes to the city with more international brand hotels setting up in Dhaka. A Hilton is under construction just opposite the Westin while the Courtyard Marriott, JW Marriott and InterContinental are also under development. This new supply will hopefully bring room rates to more realistic levels as rates are currently quite high relative to the region. Besides the opportunities that the various sectors provide, geopolitically Bangladesh has developed a balanced foreign policy which is not too one sided or antagonistic towards a specific country and this has resulted in good relations with China, India, Japan and the U.S. These balanced relations have generated commitments from most of these countries to help develop the country’s infrastructure which should be positive for the overall economy. From an investment perspective, this year has not been the best for the stock market due to nervousness in anticipation of the upcoming election and all the uncertainties that usually come with it but the correlation of the DSE Broad Index (the benchmark) with the MSCI World Index over the past five years has been negative while correlations with other major indices are also negative which makes the Bangladesh investment case very strong from a diversification point of view as well. The weak market sentiment has also made valuations in Bangladesh much more attractive with the MSCI Bangladesh IMI (Investable Market Index) Index trading at a trailing twelve-month P/E of 12.3x, a discount to some regional peers like Philippines and Vietnam while having a similar trajectory of greater than 6% GDP growth over the next five years and also displaying a longer-term history of macro stability. Given the increasing urbanisation, improving infrastructure, higher disposable incomes and a large young population, we are very positive on the outlook for consumption-focused themes such as consumer discretionary, financial services and healthcare. 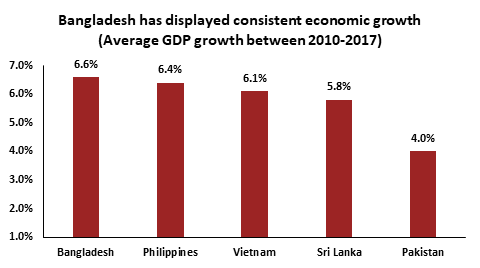 The next few months could lead to some uncertainties due to the elections as well as some amount of currency weakness but given the opportunities that the country presents and taking a five-year view, amongst our larger markets, we are most bullish on Bangladesh after Vietnam. The entire AFC team wishes our investors and newsletter readers a peaceful 2018 Holiday Season and positive returns in 2019!